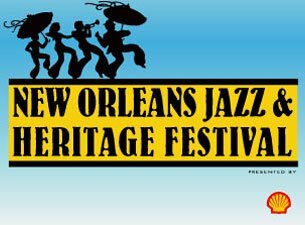 The New Orleans Jazz and Heritage Festival takes place at the Heritage Fairgrounds during two weekends in the Spring. The festival focuses on music, crafts from artisans from the area, and classic Louisiana cuisine where you can learn and enjoy the rich culture and heritage of the state. The music won’t just consist of Jazz, you’ll be able to enjoy blues, R&B, gospel, Cajun, zydeco, Afro-Caribbean, bluegrass, Latin, rap, country, rock, folk and more. We will outline a few things to help you prepare for the festival. Tickets are on sale now, so y what are you waiting for? Purchase those tickets! We want you to know that you can sign up for the festival’s E-list to receive emails in the future concerning tickets sale dates, promotions, and lineups. Something else to consider is following the festival on Twitter and Facebook for even more information about the event. First Weekend Single Day Ticket – One ticket valid for only one of the days during the first weekend. Second Weekend Single Day Ticket – One ticket valid for only one of the days during the second weekend. Another option to consider before buying tickets is to look into any Travel Packages that the festival may have. There are multiple packages for each weekend, which includes a room for each night, two tickets to the fest, (your choice of GA, or other VIP options) and shuttle transportation to and from the festival. Weekend One. Weekend Two. If you are planning to stay for any length of time in New Orleans then you’ll need to check out accommodations for your stay. We suggest the sooner the better since hotel rooms might get booked extremely early. The New Orleans Jazz and Heritage Festival website offers a plethora of hotel options to choose from for your stay in Louisiana. You can select a room type from their list. Don’t forget to get the Jazz Fest Rate to get discounts for your room during your stay. The Jazz fest offers a discount airline code for anyone who is flying via Delta Airlines for the festival. The Code is: NMRC7. You can use this code through Delta’s call service or through a travel agent. To see the details go here. Downtown – Steamboat Natchez Dock and Sheraton Hotel: Round-trip is $19 per person. Admission and round-trip is $94 per person. Hopefully you should have a good idea of what you need to prepare and be ready for at the festival. If not then you can go to the festival’s contact page to ask your questions, or you can email us at contact@ticketcrusader.com for more information.